When you first set up your Surface, the system should ask you to pair your pen. Pairing is not required for drawing with your pen. However, it is necessary to access the cap button's application launching functions. You can pair the Surface Pen or other Bluetooth devices manually by going into Settings>>Devices>>Bluetooth. Make sure Bluetooth is turned on and hold down the cap button until your pen shows up as an available device. Tap pair. Surface Dial owners should also pair that device at this time. With the pen paired, go to Settings>>Devices>>Pen & Touch and configure the actions you want the button to trigger. By default, one tap calls up the Ink Workspace’s main menu. Two taps takes a screen capture and loads it into Screen Sketch. Tap and hold opens Sticky Notes. 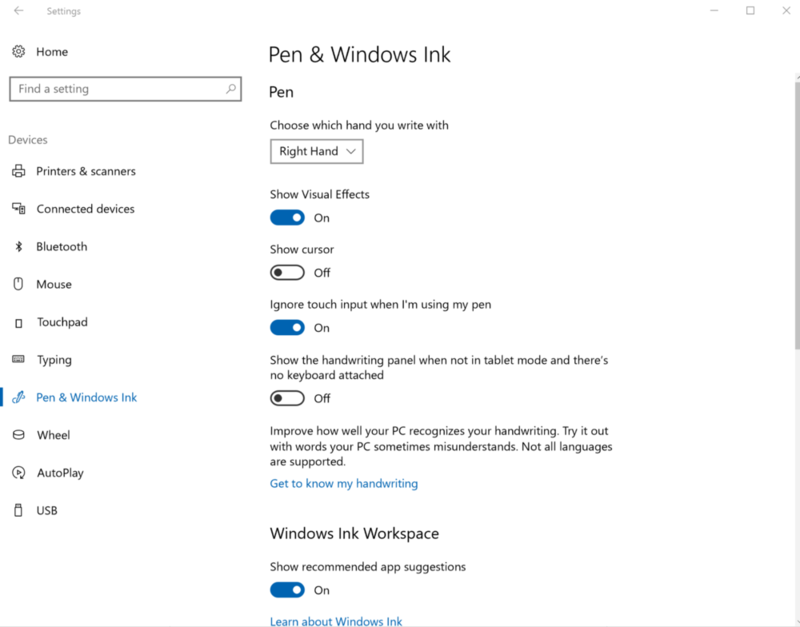 Before exiting the Pen & Windows Ink settings, choose the hand with which you write. I also recommend turning off show cursor, turning on ignore touch input when using my pen and turning off the handwriting panel. The last one is your call, but I find the touch keyboard much more efficient. If you own a Surface Dial, configure your Dial menus under Settings>>Devices>>Wheel.